New Found Glory? I hope you have your jumping shoes on! Great bands and one of my favorite venues! Despite how far I live from it, the Glasshouse has always been one of my favorite venues because of the size and vibe of the place. Their security and staff are so nice and, unfortunately, that’s rare to see at venues these days. As long as shows like this keep rolling through the Glasshouse, I’ll be making the 45-minute drive out to be in the crowd. I’d seen this tour at one of the previous Los Angeles stops to help film an interview for Band Nation. At this point in the year, most of the shows I attended involved me having my camera in my face. It was nice to take a little break and just watch a show from start to finish, especially since New Found Glory is another one of those bands that I listened to for a long time. There was some drama over the photo pass/ticket situation at the venue in LA. After some quick calls, we arranged to have a photo pass waiting for me at the Glasshouse. Originally the Glasshouse was supposed to be my show to watch and enjoy, but I didn’t mind switching things up at all since I got in for free at the LA show. I also got to see my photographer friend, Jered. 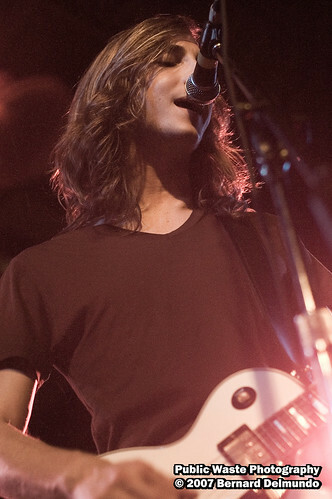 I met him at Cornerstone right before most of us got kicked out of the pit for UnderOath’s set (fun times! haha). He’s a great guy so check out his work when you’re done reading through this. 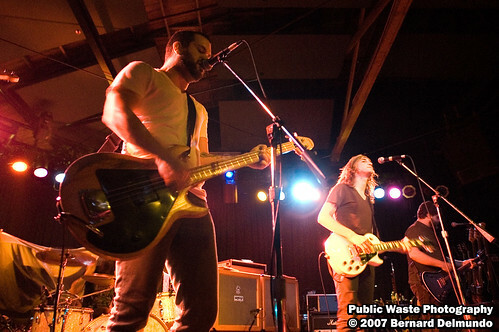 I’ve always liked going to shows at the Glasshouse in Pomona. Even though it’s a far drive from where I live, it’s very spacious and full of different areas to view the bands. There’s an upstairs standing/sitting area, raised platforms near the edges of the venue, and the huge floor where the energy seems to be the most intense. That night I had the pleasure of watching A Cursive Memory, the Receiving End of Sirens, and the co-headliners: New Found Glory and Senses Fail. First up was A Cursive Memory, who I’ve seen before but in a much, much smaller venue. I saw them in this coffee shop almost two years ago in San Pedro, California before it closed down. I would have to say that ACM has come a long way since that night in the cozy coffee shop. Back then the members were still in high school, a three-man-band and an Apple computer doing the rest. Now, a few years down the road, they are a 4 piece band with new members and a keyboard to replace the computer. Even though we arrived late for their set, they had good energy, which is important if you want to start the show off right. They made a really great impression and seemed to be the perfect way to start off the night. Up next was Boston’s own The Receiving End of Sirens. I had never seen this band before but by the end of their set, I was glad I did. They had an amazing, eclectic sound and a good sense of humor to go along with it. To celebrate that he was still alive, members of the band jokingly dedicated one of their songs to a band mate from Detroit since it had been named the #1 Most Dangerous city in the nation. TREOS had a bad experience at a venue in Los Angeles a few nights before, and they described their dislike of the city with ease. The crowd in Pomona, however, seemed to be the total opposite of that previous night and the band expressed their deep appreciation. The crowd responded positively and TREOS could see that almost everyone in the crowd couldn’t keep from bobbing their head or tapping their foot. They had a great sound and seemed to develop a larger fan base that night and I was definitely one of those people that jumped on the TREOS bandwagon. Next up was one of my personal favorites, New Found Glory. 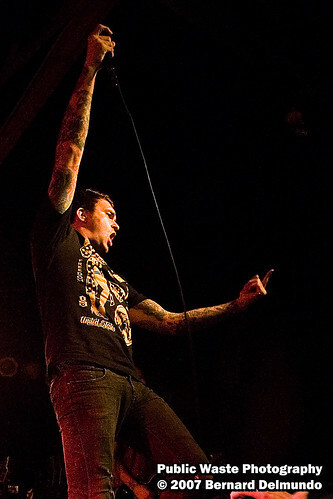 I have seen New found Glory a few times before and that was the exact reason I bought tickets to this show. 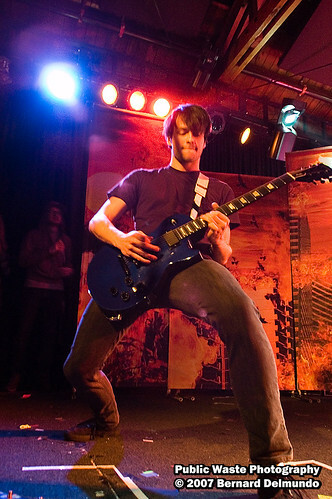 They ALWAYS put on a high intensity, fast paced and fully energetic set for their fans. 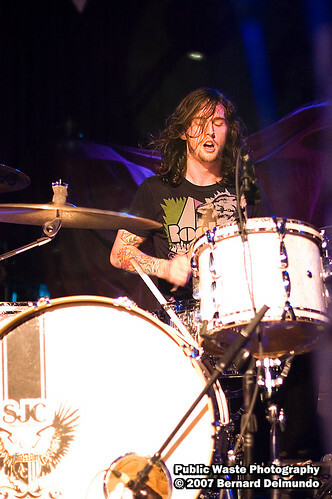 It helps that most of their songs have faster beats so that there isn’t one boring moment when during a NFG show. They had just come out with a new CD featuring covers of movie soundtrack favorites as “Iris” by the Goo Goo Dolls and “It Ain’t Me Babe” from the Walk the Line Soundtrack. The few covers that were played alongside new and old fan favorites made the night so worthwhile. The floor was intense and full of pushing and shoving due to the excitement from all of the energy that NFG constantly gives out. During their set, the crowd could be heard singing over the amplified band and I know that I was having more fun than I anticipated. I secretly wished they had headlined that night because the crowd couldn’t seem to get enough. 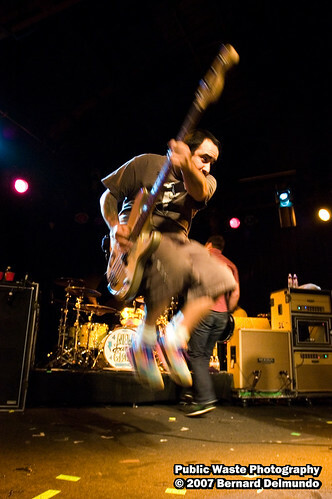 I could’ve gone home at that moment, feeling satisfied with just watching New Found Glory. They ended their set with “My Friends Over You”, and the crowd responded, with a uproar of screams and applause and I knew that NFG ended their set perfectly. 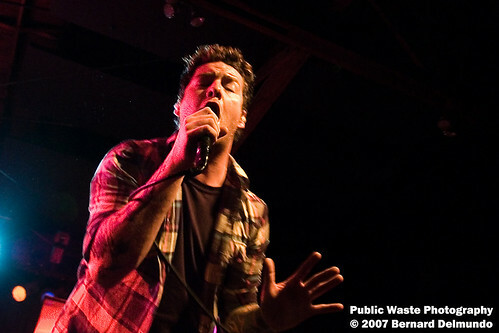 The final band and headliner of their first of two nights at the Glasshouse was Senses Fail. 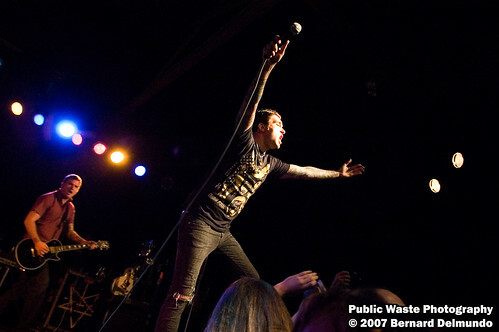 It was almost two years to the day that I had seen Senses Fail back in 2005 at the Glasshouse on Thanksgiving Night. I’ve been a long time fan of Senses Fail but I am sad to say that even though their CDs are amazingly written and recorded, I was disappointed with their live set. I’ve seen them before and I could say that I expected a mediocre performance and that’s what I got from the experience this time around. Of course, not everyone felt as I did since the fans that made up the crowd, seemed to enjoy every single second of their set. Senses Fail is a very lively and highly talented band but I don’t think that I was very impressed beyond the musical aspect of their performance. 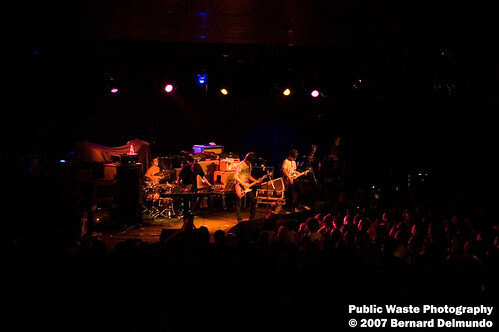 The vocals seemed to be a bit off that night but overall, Senses Fail captivated the crowd and left them screaming for an encore as they left the stage. 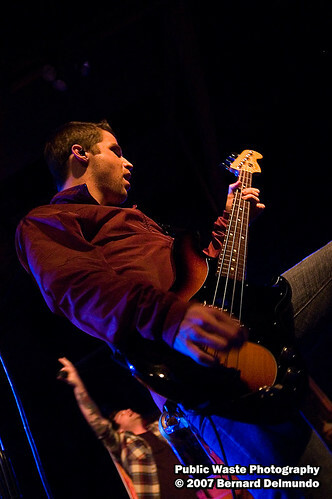 They returned shortly after with “187”, a song that could easily be the reason people became interested in Senses Fail. Although I enjoyed their set, I don’t think I walked away as satisfied as I would have been if New Found Glory headlined. Overall the night was amazing and energetic and even if I was a bit disappointed by one band’s performance, it didn’t ruin the rest of the night for me and I was very happy that I went. For all of my pictures from this show, click HERE.